The Disaster Rhetorics session at CCCC (H.28, Friday, March 15, 11am-12:15pm) brought together three scholars who are studying the rhetorical action that surrounds environmental crisis. Soyeon Lee, a graduate student from the University of Houston, began the session with a thoughtful overview of her experiences teaching in Houston following Hurricane Harvey, which made landfall on August 26, 2017, bringing catastrophic flooding to the area. With Maurice Blanchot’s The Writing of the Disaster (1980) as inspiration, she designed an oral history project for her First-Year Writing II class at the U. of Houston that began six months after the hurricane hit (Spring 2018). Lee used Donald Ritchie’s Doing Oral History (2014) to help students design interviews in the field of people who had lived through the hurricane. As for the pedagogical process, she described a need for more nuanced, embodied ecologies for students coming from diverse populations, such as immigrants and ESL students. Although sharing the stories with classmates was beneficial to understanding the rhetoric surrounding Hurricane Harvey, the transcribing process and anxiety that the students felt when leaving the school environment to conduct interviews were difficult. She left her audience with the importance of further study on translocality and international and immigrant students/residents, as represented in Ayona Datta’s Translocal Geographies (2011). Soyeon Lee can be reached at soyeonlee2127@gmail.com. Her presentation and talk documents can be found at https://tinyurl.com/y64wmwvz. She dismissed profit-driven scientific answers in favor of Earth-based stories and a practical knowledge of doing that seeks equitable solutions and reckons with injustice: a revision of the future, as described by Thomas King in The Truth about Stories: A Native Narrative (2008). She proposed to make concrete the idea of climate change, citing Michelle Simmons’s Participation and Power: Civic Discourse in Environmental Policy Decisions (2007) and the problem with a one-way flow of information top-down, from government to the populace. Her experience within her neighborhood, trying to mobilize the community to fight the location of a pig farming operation nearby, was a continuation of both her scholarly interest and personal fight for environmental justice. When she stated at the end of her presentation that she had actually brought a jar of pig manure with her, and would open it up to share the sensation with the audience, there was a general expression of surprise and disgust from the audience (and I imagined the smell then), but thankfully she was only joking. Phillips also encouraged the audience to join her for the youth climate strike that took place in Pittsburgh that day. Dr. Lisa Phillips can be reached at Lisa.Phillips@ttu.edu. Her presentation slides can be accessed at Phillips_Cs_2019_Performing_3-15-19_REVISED. Liz Cozby, graduate student from Texas Woman’s University, rounded out the session with her views on Hurricane Harvey using actor-network theory. She began with a fascinating discussion of synapses and brainspeed-connections that were then compared to the nodes of the network that makes up human interactions and responses: in the face of a disaster like Hurricane Harvey, why can’t humans react quicker and better to improve outcomes? She proceeded to describe the multiple human actors who worked to get aid to survivors of the hurricane, such as the Cajun Navy, civilians, FEMA, the local police, the Red Cross, and even celebrities, but all having different agendas and difficulty coordinating. Cozby then told the story of Zello, a walkie-talkie app for cell phones that allows users to communicate even when cell phone service is down (although it requires Internet service/Wifi). At first, it did not work on older phones and thus left out minority and poor populations from the ability to communicate, but the app was later fixed to include this capability. 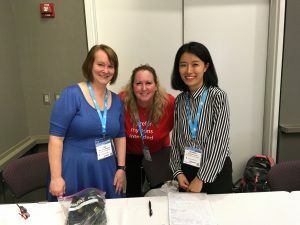 In the end, she sees connections being made and people trying to do good things in the wake of disasters. Liz Cozby can be reached at ecozby@twu.edu. Her presentation can be found at https://www.emaze.com/@AOCCORRRW/. Overall, the Disaster Rhetoric session was inspirational to scholars who are concerned about the rhetoric surrounding environmental issues: how we teach the topic when teachers and students are impacted by disasters, how we respond to environmental injustices in our own communities, and how we react to help others survive disasters. 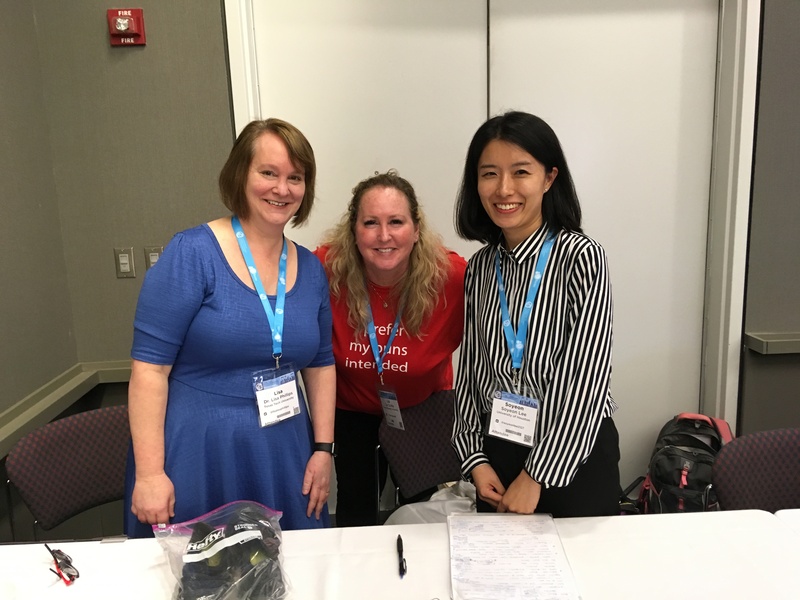 The Environmental Special Interest Group that met at CCCC 2019 was attended by Dr. Lisa Phillips, who agreed to act as communications manager and help with the establishment of an Environmental Standing Group at future conferences. Co-chairs of the group are Christina Boyles (cboyles@msu.edu) and Michael S. Geary (michael.geary@bristolcc.edu). Those who are interested in joining this movement are encouraged to contact her for further information. Mary Le Rouge is a second-year doctoral student in Rhetoric and Composition at Kent State University. Her research interests include digital rhetoric and discourse studies, especially in relation to climate change, technical communication, and literacy.